I was born in Athens 1969. I studied marketing in the U.S, And worked in family business In Africa and Europe. 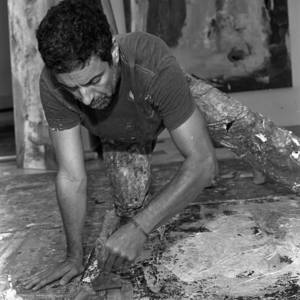 In 2001 I started my esoteric trip, Which was actually a continuous 7 years self exploring journey, from India to Santa Fe ... At that point painting came along ... What I can say about my work is that the canvas starts for me as a playground, it becomes a battlefield,and in the end it reveals my devotion and gratitude to the unknown .. In this journey music is my sacred friend. It has always been my guide and awakening for my spirit and with the blessing of the sounds everything that is happening in my life and canvas becomes a celebration.